WelCom November 2017: This month WelCom’s journey of faith visits the Parish of Our Lady of the Valleys, which combines the Catholic communities of Heretaunga and Stokes Valley. 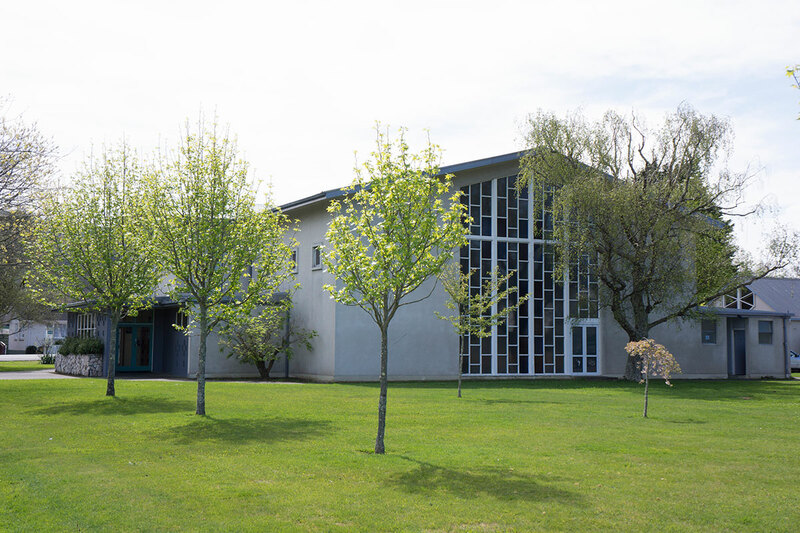 Our Lady of the Valleys Parish is a mixture of suburban and rural lifestyles including Heretaunga, Trentham, Silverstream, Pinehaven, Whitemans Valley and Stokes Valley. The parish connects to Lower Hutt and Upper Hutt cities. To the south, the parish borders the Parish of Te Awakairangi. 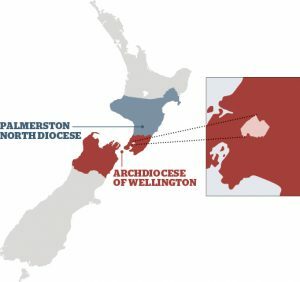 The eastern boundary is shared with the Catholic Parish of the Wairarapa and to the west the parish extends towards Our Lady of Kapiti Parish. 1931: St Patrick’s College Silverstream established. 1933: Daughters of Our Lady of Compassion establish a Home of Compassion in Silverstream. 1941: SMSM Sisters (Marist family) transferred novitiate from Wellington a house in Heretaunga named Oceania. They also taught catechism to local children. 1947: First Masses celebrated in Stokes Valley as part of Lower Hutt parish, in private homes then Koranui Hall. Average monthly attendance 10. 1947: 10 acres of land purchased in Stokes Valley by Catholic Church. 1951: Heretaunga parish officially established. 1952: CWL branch starts in Heretaunga. 1955: Fundraising starts for Heretaunga Church. 1955/59: St Francis Xavier Church Hall in Stokes Valley built by parish volunteers and working bees. 1959: Cardinal McKeefry opens St Francis Xavier Church Hall. 1960: Cardinal McKeefry opens and blesses Our Lady of Grace Church, Heretaunga – fundraising and construction with help of parish community. 1961: St Brendan’s Primary School opens. 1962: Stokes Valley an independent parish. 1975: St Francis Xavier Church built, opened and blessed. 1985: Cardinal Tom Williams opens new pensioner complex in Stokes Valley built jointly by LH City Council and SVdP. 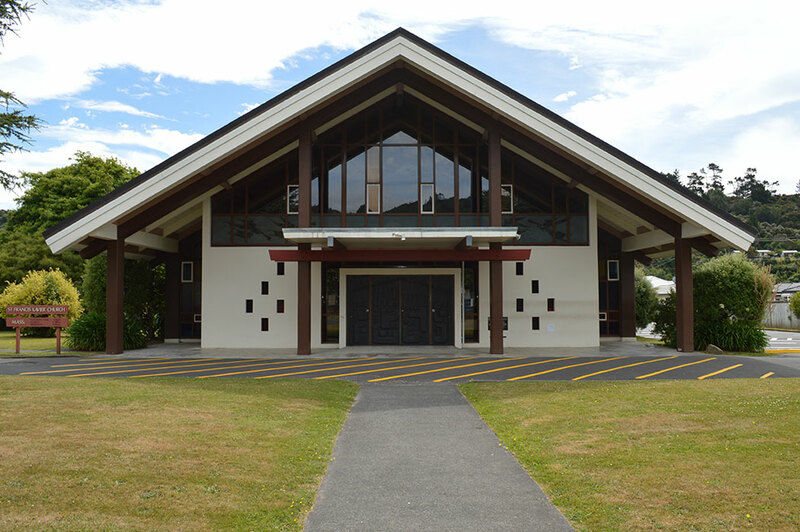 1988: Pettit Centre constructed next to Heretaunga Church for parish amenities. 1995: Oceania convent closed and training centre shifted to Auckland. 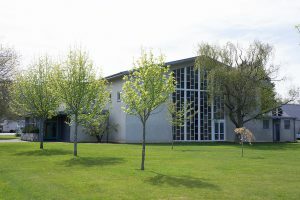 2000: Marist priests leave St Patrick’s College Silverstream to take up Marist’s changing apostolate. 2001: Our Lady of Grace Parish celebrates 50 years. 2012: St Francis Xavier Parish celebrates 50 years. 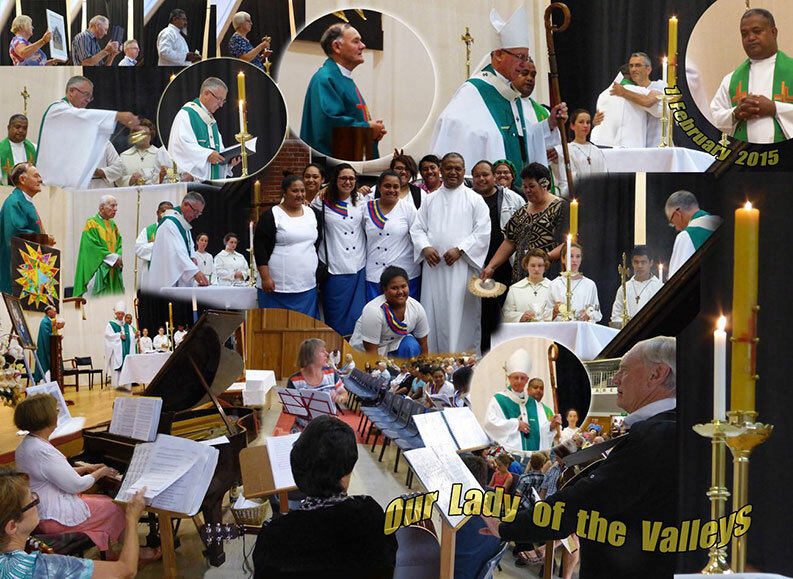 2015: The two parishes are amalgamated to form Our Lady of the Valleys Parish. Fr Tony Kearn, parish priest. While there has been a Catholic presence in this area since around the 1840s, Our Lady of the Valleys was established as a result of the merger in 2015 of the two existing parishes ‒ Our Lady of Grace Parish in Heretaunga, formed in 1951, and St Francis Xavier Parish in Stokes Valley, in 1962. 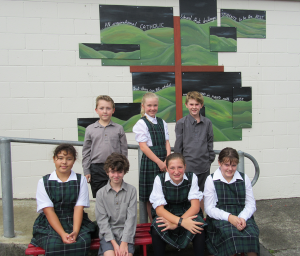 We are part of the Upper Hutt Pastoral Area comprising ourselves and St Joseph’s Parish. Today, our parish is made up of many peoples from different cultures, backgrounds and nationalities. 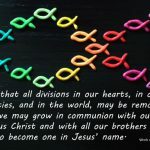 Under Christ our Saviour and through the outpouring of the Holy Spirit we strive to be united in faith and good works. We are helped in all this through the organisations and ministries who work hard and the many people who give willingly and lovingly of their time and talent to support our parishioners, activities and ideals ‒ and being open to the call of the Spirit to make God and Jesus Christ, his son, present and visible in our community. Two parishes coming together – amalgamation 2015. St Francis Xavier Church, Stokes Valley. Our Lady of Grace Church, Heretaunga. Members of Samoan Aulotu (community). Our parish from Stokes Valley to Heretaunga covers a diverse area being part of Lower Hutt and Upper Hutt cities. Having our two churches as one parish has meant a lot of changes for us. Joining together two quite different parishes into one has had its challenges and adjustments, such as new Mass times. However, we are learning to pull together as a parish and we have been fortunate in having various celebrations to help bring us closer. In Stokes Valley we have a strong feeling of belonging, due to our geography of being in valley. It is a multi-cultural area with a very diverse population. 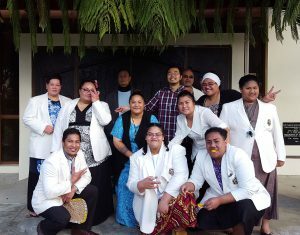 We have a growing community from the Philippines and our mainly Samoan choir brings joy to all our Masses and celebrations. The strong Samoan community are great asset to all parish activities. Our Passionist family groups are alive and well and a core of many of activities, for example picnics, our annual lunch and other special occasions. The groups have been running for almost 30 years with many original members, as well as new members all the time. 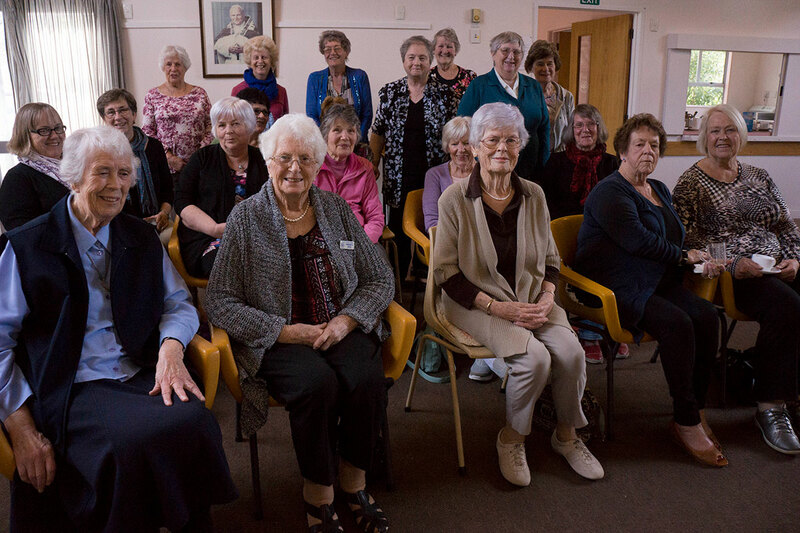 We have a retirement home serviced by our parish, with weekly communion and a monthly Mass. 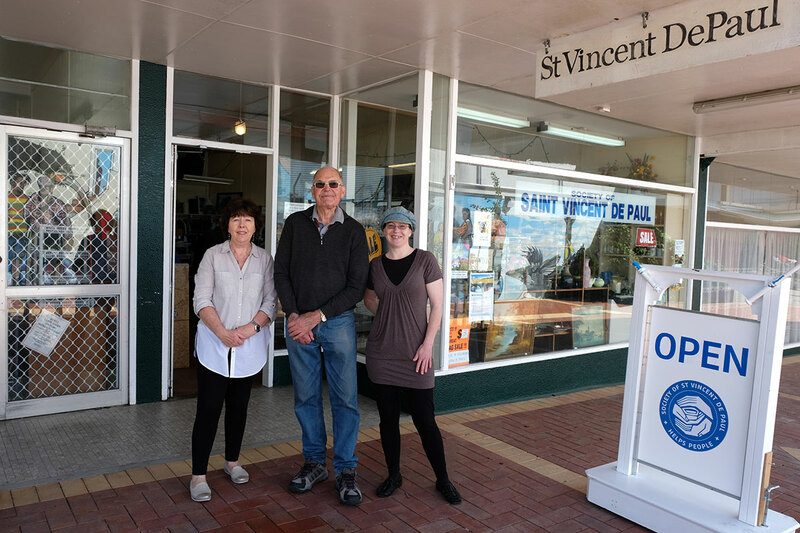 Our St Vincent De Paul Society Conference is in great demand serving various community needs. We have a shop in the Stokes Valley shopping centre, run by a group of volunteers from Stokes Valley, Taita and through to Upper Hutt. It is a ‘drop-in centre’ for some as well as supplying weekly food parcels in the wider community. 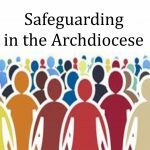 We look forward to the positive effects the Archdiocesan Synod will have on our parish as we move ahead together. 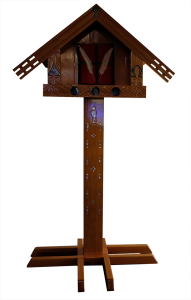 Parishioners of various nationalities and cultures were asked their advice and help to make a tabernacle that would be distinctly Stokes Valley when the new church was built. The base was made and donated by John Scherrer, Swiss; the wood for the solid post and tabernacle was donated Henry Hendriks, Dutch; the post was inlaid in Tiwha ‘Father of Pearl’ by Peato Perez, Tokelau; the paua was donated by Garry Simpson, New Zealander, who also had the greenstone cut for the base, and donated the greenstone key; Tokelauns Akenehe Niko and Melehete Tuilava wove the inside of the tabernacle; Jan Gilbert, UK, made the inside covering and curtains; and the tabernacle itself was cut, assembled and varnished by Bill Gilbert, UK. St Brendan’s School, Heretaunga, is a warm and welcoming place. Our roll of 290 students are like a family, with the Year 7 and 8 students nurturing and guiding our younger students. The school values of Faith, Love, Innovation, Courage, Excellence and Respect permeate through our learning and in the playground. We ensure that St Brendan, who was known as an adventurer and navigator, and the SMSM Sisters, who were missionaries, feature strongly in our school ethos and language. We enjoy regular visits to Our Lady of Grace Church, where the students and the parishioners join in prayer and celebration of the Eucharist. We have a close and supportive relationship with Fr Tony Kearns. He creates a welcoming atmosphere for our students, ensuring the Mass caters to their age. We hope when you visit St Brendan’s you enjoy the colourful murals, spend time in our outdoor spiritual space, and feel like a member of our school family. 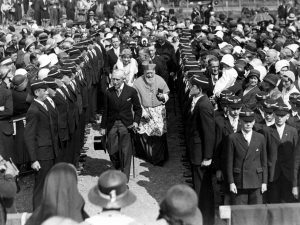 Laying the Home of Compassion Silverstream foundation stone 1933 Lord Bledisloe, Archbishop Redwood, Lady Bledisloe, Fr Dowling SM Rector, Fr Pat Smyth SM, and St Patrick’s College students. 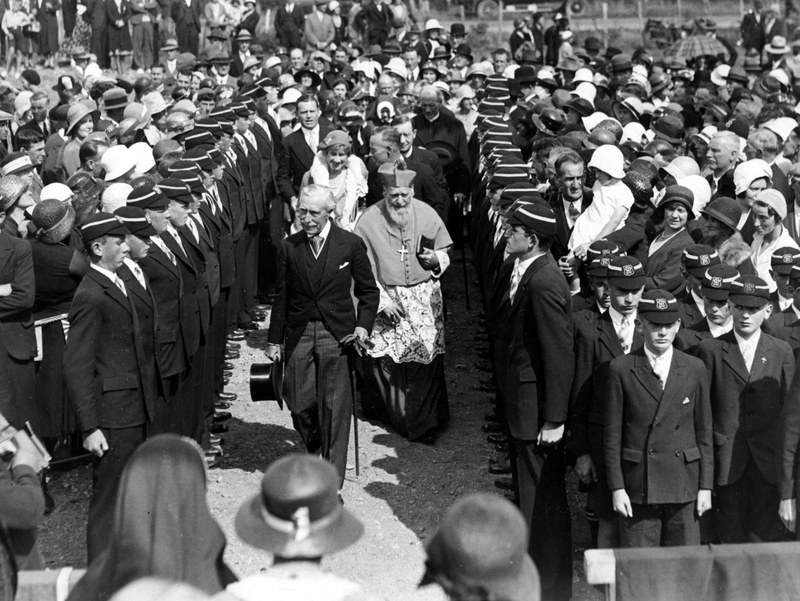 The St Joseph’s Home of Compassion at Heretaunga was opened in 1933. Initially ten sisters cared for disabled men and boys who, previously, had been nursed by the sisters at Buckle St. The Home has expanded over the years and the Sisters of Compassion have continued in that same vein of Christian care for those most in need with many individuals and groups supporting them along the way. There has always been a reciprocal relationship between the Home and St Patrick’s College, Silverstream. The Marist Fathers from the college attended to the spiritual needs of the sisters and residents of the Home, while the sisters visited the college to attend to sick or injured students. The students have helped with jobs around the Home and befriending the residents. A nursery, opened in 1961 to care for babies with disabilities, continued until 1980. During 1992, a new 42-bed home was opened, caring for both women and men. In 2003 the convent was converted into a 12-bed rest-home wing and the hospital was extended to 45 residents. A new dementia wing at St Joseph’s opened in 2009 as the first Catholic Rest Home in New Zealand offering facilities for 16 patients with dementia. It was named after one of the Sisters of Compassion’s patrons, St Jean Vianney. The home has a very good pastoral care worker supporting the residents, and the sisters and priests living at Marion Court. The sisters have always been grateful to the volunteer directors on St Joseph’s Board, as well as to the management and nursing staff; without them we would not be able to maintain the Home. They continue to fundraise and contribute in many other ways towards keeping the Spirit of Compassion alive. Today St Joseph’s at Heretaunga is one of the few Catholic and Christian residential facilities offering respect for all stages of life. It offers a high-level of health and pastoral care, which has resulted in the Ministry of Health granting the Home a long-term operational licence. 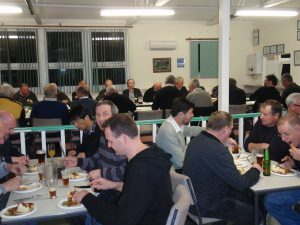 Men’s group enjoying ‘pea, pie and pud’ night. Our Lady of the Valleys Men’s Group started informally in the mid-1990s among men from the parish with an interest in motorcycles. They met at a local bar on the first Wednesday of the month to discuss the merits or faults of various motor cycles or recent bike rides they’d been on. Other men among the group joined in to socialise and discuss and resolve world problems. This led to an invitation being placed in the bulletin to other men in the parish and to the non-Catholic husbands and partners to join these occasions for socialising. Now it includes St Francis Xavier Parish. The gatherings attract a regular group of men, from as few as 10 in the winter to 34 at other times. For a small charge of $2 from all attending, fish and chips are bought for everyone to enjoy ‒ a bit like the loaves and fishes. We also have ‘pea, pie and pud’ nights, and a Christmas gathering at the Petitt Centre, which attracts up to 60 to 70 men. We get to know others in the wider parish so when we need to carry out work, like painting the presbytery or putting back the pews in Our Lady of Grace Church after the recent earthquake strengthening work, there is a ready group to call on. The Society of St Vincent de Paul Stokes Valley conference celebrated its 50th anniversary in July this year. Acting president and a foundation member, Gordon Holmes, spoke at the celebration. Fifty years ago two Brothers from Lower Hutt addressed our Sunday Mass and inspired eight of us to form our first conference in Stokes Valley. Under our first president John Mooney’s leadership, we did everything from painting houses to delivering food parcels and visiting the unwell. 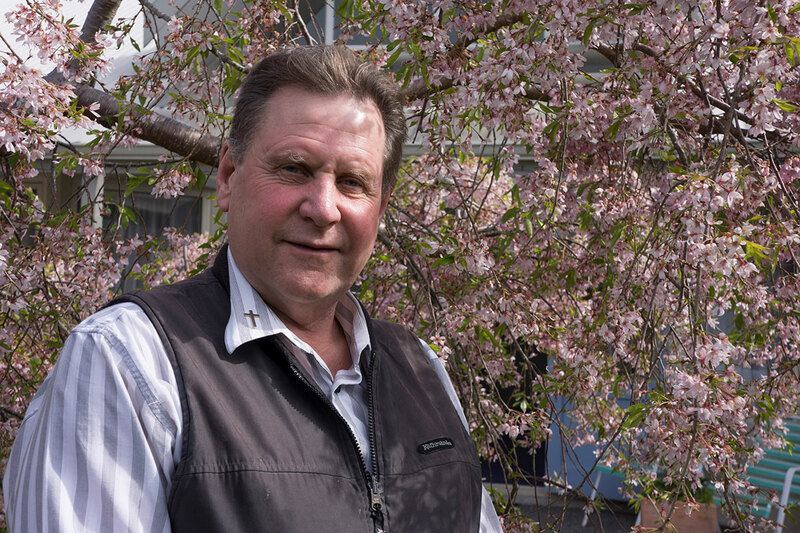 We were rostered to help at the nearby Home of Compassion and the Silverstream Hospital for the elderly and at the two Petone shops selling clothes and furniture. Two years later the ladies’ conference was founded to work with those in need. 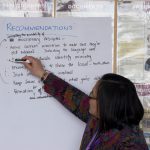 Anglican nun, Angela Capes, inspired our conference to help refugees coming to New Zealand, then Stokes Valley, including the first refugees from Chile. A combined committee of Stokes Valley churches was formed to help refugees from Vietnam, Laos and Cambodia. Today we are helping Syrian refugees resettle here. 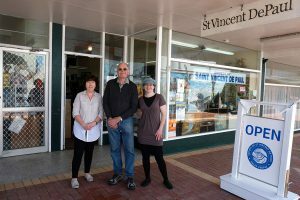 In the late 1990s Alan McNeil started the SVdP shop in Scott Court ‒ which continues to flourish with many wonderful volunteers today. The Sisters of Compassion asked parishioner Frank Vaillini to take over their bread run and we began a food-delivery service, which today still serves Wainuiomata, Petone, Naenae, Taita, Stokes Valley and Upper Hutt. The shop has helped us provide relief to the needy and the sick and just to lend a listening ear to those who are lonely. The miracle of work is being done in God’s time. Frederick Ozram will surely be proud. Gordon and his wife Linda Holmes were each presented with papal medal this year for their many years of dedication to the parish and the St Vincent de Paul Society. The Heretaunga conference is a small, dedicated group that offers a helping hand, or words of encouragement when needed. We attend to the elderly’s needs in retirement or private homes, contribute to Mass around St Vincent’s feast day, and occasionally get requests for financial help. We have basket at Mass for non-perishable food for a local food bank and we supply donated items to the Stokes Valley SVdP shop. Parishioners are very generous with our Christmas parcels and annual collections. We have a close relationship with St Brendan’s Catholic primary school and St Patrick’s College Silverstream. CWL Heretaunga branch members’ meeting. CWL Heretaunga evolved out of its association with Upper Hutt Branch 67 years ago. In 2017 we continue to be a thriving group of 34 loyal members with some recent new attendees. 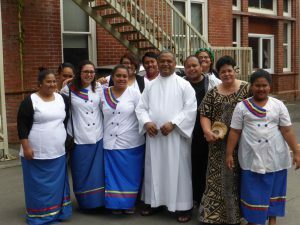 As well as fundraising for various charities nationally we also support the Sisters of Nazareth, our Mission Station in Fiji. We are conscious of local needs too. We have made a contribution to the Upper Hutt Housing Trust with their fight for affordable housing and we have an ongoing commitment to St Brendan’s School to help families. Recently we helped organise a quiz evening, generously run by Susan and John Lloyd, with the proceeds going to the parish. And a few loyal knitters have been busy over the winter months producing slippers for the children at the Holy Family School in Porirua. And together with the parish, our relaxed get togethers ‘5th Wednesday of the month coffee mornings’ are open to all. Our Lady of Grace music group provides the music and singing to lead the congregation. On various Sundays the dedicated Samoan community leads the music and singing. 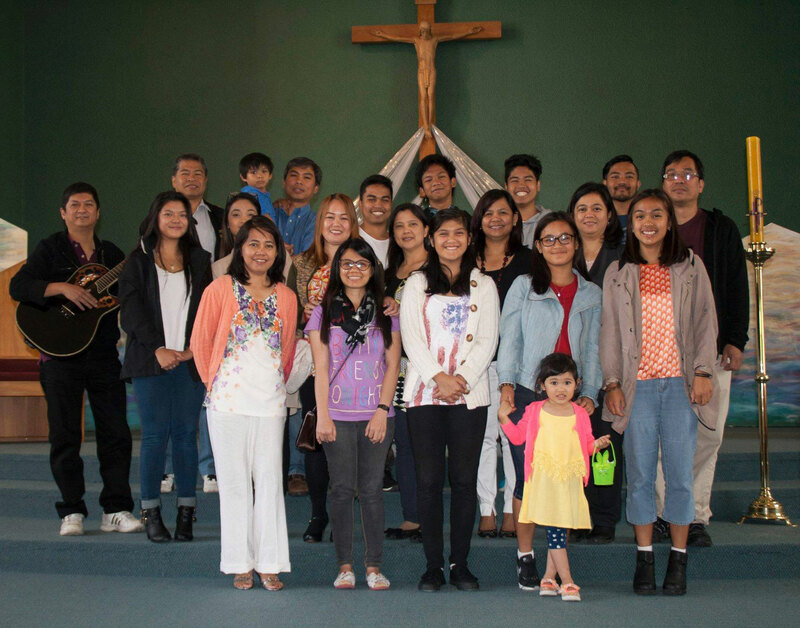 The Holy Family Filipino community leads the singing on the fourth Sundays with musicians and a choir providing beautiful music in English and Filipino. On special occasions a cantor sings the psalm. On the 5th Sunday, a pianist provides the music. St Francis Xavier’s Samoan choir leads the singing every Sunday. ‘Mother’s Prayers’ is a non-denominational, multi-cultural, international network of women who meet to pray for their children and grandchildren under the guidance of the Holy Spirit. We have group prayer meetings every Tuesday, with Mother’s Prayers on the first Tuesday of each month. We start our meetings at 7.30pm with a cuppa and a chat and have become good friends. We sing praise and worship, offer thanksgiving, worship and intercession, and end with singing. Over the years we have experienced many answers to our prayers for healings, employment, relationships, accommodation etc. To find out more contact Doreen O’Hagan (04) 526-9093, Mob 027 605 3016. Our Pope John Paul II Discussion Prayer Group meets fortnightly in homes to reflect. We pray the Rosary and our own special prayers, followed by afternoon tea. It is a journey of spiritual growth and strengthening of our faith. We began our Heretaunga Friendship Circle with a group of knitters making squares for blankets while offering a prayer for the recipient parishioner. Six ‘prayer blankets’ later the group had become a monthly gathering for friendship and fellowship. Now have over 30 women gathering on the first Saturday afternoon of each month in our parish hall. We welcome all denominations and friends to come along to our gatherings. Doreen O’Hagan, Christine McDonald, Pauline Lockyer and Pauline Quinn.